The Challenge: Eat something you’ve never had before. When you’re a kid, it’s inevitable that you’re trying new things all the time. Sometimes after having to sit at the kitchen table for two stubbornly long hours. Well, as I walked around the entire grocery store, then walked some more, I realized that the things I haven’t tried in my 27 years have been for a very good reason. I just couldn’t get myself to pick up the little can of sardines. I almost puked just thinking about it. I am not that picky of an eater, so this was a challenge. Eventually I stood there in the baby food isle, deciding between beef and veal. I wanted to pick one of the meats, because, quite frankly, that is just nasty to think about meat in ‘baby food’ texture. I have never had veal before, so I thought this would be a good way to go. The video of me eating this is pretty graphic — total gag effect. It was far nastier than I even dreamed. It was so bland, yet smelled so strong. Meat should never be mushed. I almost spit it out. I know I would have if it weren’t for that video camera in my face. Perhaps you’ll remember the roasted soft squid from my visit to the oriental grocery store back in Challenge #1 (I know I’ll never forget it!) I was very curious about that stuff, and originally wanted to buy a package but alas, I had no cash on me. Well today was the day for my curiosity to be satisfied. Kim picked up some squid for me while she was out running errands. I have to say, psychology got to me. Even though the food — and I’m using that term lightly — didn’t look anything like squid, I couldn’t get the slimy guy out of my head. I definitely know it’s all psychological, too, because I NEVER think of cows when I’m downing a juicy hamburger. It tasted sort of like shrimp or crab, which I like, but in jerky format. Pretty chewy. I can’t say that it was terrible, but I certainly wouldn’t go putting this in bowls for my party guests, which is what the display recommended. I once heard that in most cases, if you try something three times, you’ll start to like it. Maybe I’ll take another stab at it this evening and I’ll end up becoming a squid jerky junkie. Today I hit the produce aisle at the grocery store and hunted for an untasted fruit or vegetable. After perusing several differnt items, I chose the mango. I have never had a mango before and was even unsure as to how I was going to eat it. 🙂 I did a little research on how to cut it – don’t eat the skin – and began the process of cutting up the mango. It was a bit of a challenge, made moreso by the flat wide pit. I must have missed the diagram of the inside of a mango 😉 Anyway, it tastes and has the texture similar to a nectarine in the outer section as you get closer to the pit the texture changes to a more peachlike texture – softer and with those fiber-things. And overall there is a pine taste – in fact I still taste that a bit now… I’m glad that I tried a new fruit! Hi Kim! Michele sent me! I.Love.This.Idea! I am bookmarking you and will be back again and again. My husbands response to your challenge was “That’d be hard to do!” Then I mentioned Sushi! He won’t touch the stuff. I also believe Kim won this challenge. As Jason stated, squid can be faked to help you believe it’s shrimp, it’s a stretch but it can be done. Not even babies should eat that crap you ate! And I’m glad she did. Just wish I got here sooner. You guys are great! I’m joining the challenge in my lurker sort of way. Please don’t end after 40 days. Tonight I ate vegetable potato pancakes – it was a mix – the vegetables were those small dried things, like I’ve seen in other mixes containing “vegetables”…red, green and orange specks were visible in the pancakes….meant to resemble onion, carrot, and the red? I’m not sure….whether they were “real” vegetables I’ll never know. The best way to describe the taste is like mixing potatoes with “Mrs. Grass” vegetable soup mix, or some other boxed dried vegetable creation. I’m sure the astronauts have better. Not as high on the gag meter as Kim, but definitely not making it again any time soon! Food, I have a love/hate affair with it and I’ll explain later. I was going to make this easy on me. First I thought of tea, then V-8, then tomato juice, and finally prune juice- the juice of Regular seniors. But you drink this stuff, not eat it. So tonite Linda and I returned to the scene of the Kiddie cocktail resturant and I thought I would sample one of Linda’s favorites! Liver! I figured this would be easy because it would be deep fried and covered in batter. This would surely drowned out the taste. But surprise, it was only available sauted in butter with mushrooms! Ouch! I sampled a mouthful and I chewed it really, really good and I have to honestly say that it had the taste and texture of s___ I think. Luckly I had a glass of water at hand. Here is my best childhood memory of food. One Saturday nite it was spagetti and one Saturday nite chili. Chili nite was bad because I hated my mom’s chili. Odd as it seems, she would never drain the grease from the “thifty” hamburger. The kidney beans would float on the grease like sailing ships on the Atlantic. The rule in our home was that if you didn’t eat supper you got it the next day for breakfast cold. Now imagine the kidney beans stuck in the hardened grease like sailing ships at the North Pole! I’ve seen those nasty squid things at oriental grocery stores. They look intensely nasty as do sardines… hope you guys are something good to get that taste out of your mouth! I wasn’t sure how I’d take care of today’s challenge until I sat down to a buffet lunch. I got all the “usual” stuff I like and wasn’t even sure I saw something I had never eaten. Then, they called to me, the green olives. I took a big bite of one and I really thought I might throw up. I was at a large table with family, so I instead gulped down some water and swallowed the rest whole! I wrote up an introduction toset theory. How does that have anything to do with eating something new? You’ll have to read it and see :). fyi..some asians think that the world oriental is the eqivalent of “nxxxer” for african americans. Herbert, I suppose that may be true, but the name of the actual store was “Lee’s Oriental,” so I’m not sure what else I’d call it. Well, today I did have almonds – the real kind. I know that’s not super duper exciting, but I’ve only had things with almond mixed in, but not straight-up almonds. They were quite tasty! I was gonna try some mix at Starbucks because I don’t like coffee at all, but I wasn’t able to go today. Maybe another day. I’ll let you know if I do. Last night at The Olive Garden, Doug and I remembered we had not done this challenge. So once our salad came to the table we choose our weapons. Doug tasted the green pepper that no one eats and I ate some of the black olive- very bland by the way. Doug did not like the black olive either. I tried some of the pepper, but not enough to really tell you what it tasted like- I am a baby…..
To really get a love of squid you need to go to Carrabbas and order calimari with ricardo sauce on the side. That way you get the standard red marinara sauce on the side and the real bonus, the ricardo sauce which is lemon butter with hot peppers. 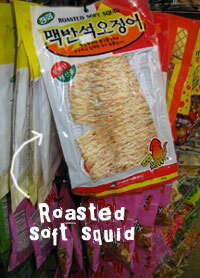 If there’s ever any hope of liking squid, this is it;not some dried imitation. I also have a great story about my Dad and beets if you’re interested. So I tried this frozen tuscan veggie bake dinner that’s been in my freezer for a while. It was one of those things that sounds good at the grocery store, but after a while you wonder what inspired you to buy that. It looked like lasagna with no cheese, containing somewhat unordinary vegetables (such as eggplant and sweet potato), and covered in reddish brown sauce. Ick! I’d been psyching myself out for a while, putting off trying this. I even had a dream one night a while ago that I was eating it! I know that even dinners that might normally sound appealing can turn out icky when they come from a frozen box, so I was especially skeptical of this. I ended up having one bite, and within the first two seconds, thought, “Hmm, kinda tastes like lasagn- ew.” Not HORRIBLE, but definitely a little icky. My stomach’s on the weak side, so I ended up not finishing it. But at least I tried it, finally, and it cleared up some space in the freezer! I ate some very different cupcakes and flan. It was the flan that was gonna get me as I had decided long ago that I wouldn’t like it before I ever tried it.